Student unions at Liverpool, Bristol, and King’s College London have come bottom of a Tab league table assessing how much value for money students are getting from the people who serve them. Each year universities pay some of the money earned from tuition fees and other income sources as a grant to their students union, but it turns out not everyone gets a good deal in return for their money. 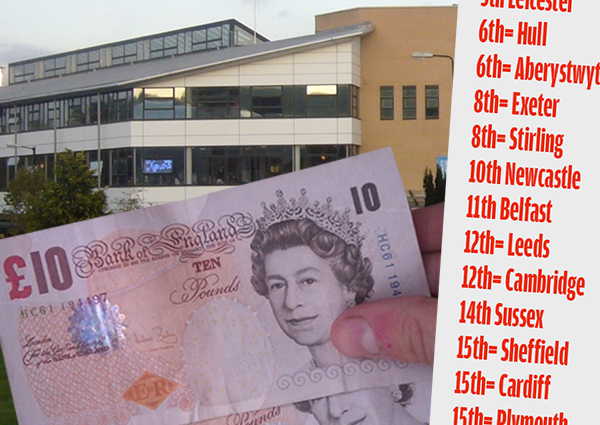 Our league table of 35 universities compares the money student unions cost their university with the scores awarded by students to their SU in the 2014 THE Student Experience Survey. Liverpool were found to have the most expensive student union of those surveyed, receiving an average of £3.9 million from their university over the last five years. Despite these high running costs, Liverpool only placed 29th for student satisfaction, giving them the worst value for money score in our rankings. Any Liverpool students feeling ripped-off are advised not to contact their student union officers, it probably won’t be worth it. The second most expensive student union at King’s College London placed joint 33rd on our league table, tied with Bristol which received one of the lowest student satisfaction scores. Probably spending all the money on London real estate costs, am I right?? When contacted by the Tab, Bristol’s SU President Rob Griffiths said: “We’re working hard with the university to deliver for students and the refurbishment of the Richmond Building will go some way towards addressing this. “Satisfaction with our services has clearly been affected during the building work”. While Bristol waits for the building work to finish, UEA are sitting pretty at the top of the tree, offering the best value for money service on our league table. They are ranked in the top five for student satisfaction, yet have an average cost of only £490,000, approximately one eighth of the cost at Liverpool. Any Liverpool students considering relocating to Norwich (it’s not actually that inbred, to be honest) can download a prospectus here.